Ectomycorrhizal fungi in alder forests: a global anomaly in richness and composition? When I took a faculty position at Lewis & Clark College in Portland, Oregon four years ago, I was excited to work in a geographic area with a rich history in mycology. In particular, I had long been curious about the ectomycorrhizal communities associated with alder (Alnus) trees, which are a common component of the moist forests of the Pacific Northwest. Prior research by Randy Molina and colleagues at the U.S. Forest Service had found that alder ectomycorrhizal communities are strikingly different from those associated with other host trees (e.g. conifers and oaks) (Molina 1979, Molina 1981, Miller et al. 1992). One of the unique features of these communities is quite low species richness. Only about 50 species are known to associate with alders worldwide, whereas it has been estimated more 1000 species associate with a single conifer, Douglas-fir (Pseudotsuga menziesii), across its geographic range (Trappe 1977). A second distinguishing feature of alder ectomycorrhizal communities is the dominance of genus-specific species. Other hosts associate with ectomycorrhizal species that are also genus-specific, but they are rarely the dominant fungi present in those forests. I began my own work on alder ectomycorrhizal communities by examining the composition of fungi present on the roots of red alder (A. rubra) at four sites in western Oregon. Earlier studies of the ectomycorrhizal fungi present on alder roots had relied on morphotyping methods to quantify species richness. A difficulty with those methods is that they often underestimate richness because they have a relatively limited number of characters from which to make species-level distinctions. To more accurately determine the richness and composition of ectomycorrhizal fungi associated with red alder, an undergraduate student, Turin Hill, and I used a molecular-based approach. We extracted DNA from 400 fungal-colonized root tips and amplified a gene region (ITS) widely studied by other mycologists. Using DNA sequence information, we were able to confirm that the ectomycorrhizal community on red alder roots was indeed species poor and dominated by a suite of host-specific species (Kennedy and Hill 2010). Specifically, we found a total of only 13 species of ectomycorrhizal across our root samples, with two Tomentella species, Lactarius cf. obscuratus, Alnicola escharoides, and Alpova diplophloeus, being the dominant members of the community. A question that has naturally arisen from research on alder ectomycorrhizal communities is why they are so distinctive. One of the main hypotheses involves the fact that, along with ectomycorrhizal fungi, alder trees also host nitrogen-fixing bacteria. These bacteria form nodules on roots in which they fix atmospheric nitrogen in exchange for photosynthesis-derived carbon. This nitrogen-fixing symbiosis is present with other plants, but not among any of the other dominant ectomycorrhizal host genera present in temperate forests. Given this unique tri-partite interaction (i.e. alder plants, nitrogen-fixing bacteria, and ecotmycorrhizal fungi), it has been speculated that nitrogen-fixing bacteria may affect alder ectomycorrhizal fungi in two main ways. The first is by significantly increasing the soil nitrogen levels present in alder forests. It is clear that some ectomycorrhizal fungi do not grow well at high nitrogen levels and the composition of ectomycorrhizal communities often shifts across natural and man-made nitrogen gradients (Lilleskov et al. 2002, Cox et al. 2010). As such, high soil nitrogen levels may act as a filter that prevents the establishment of ectomycorrhizal species found in other forests. A second way that nitrogen-fixing bacteria may affect alder ectomycorrhizal communities is by changing host nutritional needs in a way that favors fungi adept at acquiring nutrients aside from nitrogen. In particular, nitrogen-fixing plants are often limited by phosphorus, so alder trees may actively select for fungi with the enhanced enzymatic abilities towards phosphorus acquisition. It is important to note that these two different effects are not mutually exclusive and may actually work in concert to limit the ectomycorrhizal species pool present in alder forests. While nitrogen-fixing bacteria have long been the “smoking gun” explanation for the unique composition and richness of alder ectomycorrhizal communities, there are other possibilities. The study of alder ectomycorrhizal communities has focused exclusively on temperate geographic regions, but alders also occur at tropical latitudes in Central and South America. Studies from many other groups of organisms have identified a trend that species richness tends to be higher in tropical regions and decrease as one moves towards the poles (i.e. the latitudinal gradient of species diversity) (Townsend et al. 2008). Intriguingly, while this pattern has received much less study for ectomycorrhizal fungi, the limited data currently available suggest the pattern of richness may be reversed for this group of organisms (Tedersoo and Nara 2010). Given these two different predictions about ectomycorrhizal diversity in tropical forests, I decided to investigate the ectomycorrhizal communities associated with alder in tropical montane Mexico. 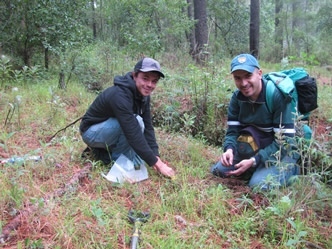 The goal of that study was to determine if alder ectomycorrhizal communities showed similar patterns of composition and richness in a very different environment than areas previously studied. If so, that would suggest that our view of alder ectomycorrhizal communities is not biased by their location of study. In central Mexico, two species of alders, Alnus jorullensis and A. acuminata, grow in montane forests either alone or with other ectomycorrhizal host species such as Montezuma pine (Pinus montezumae). With financial support from a Fulbright fellowship and the National Science Foundation, I spent my fall 2010 sabbatical working with Dr. Roberto Garibay-Orijel at the National Autonomous University (U.N.A.M.) in Mexico City (Figure 1). We identified a series of field sites where both of these alder species were present and used the same molecular-based approach as our previous Oregon alder study to examine community composition and richness. This project was completed with the help of two undergraduate students, Rodolfo Angeles-Arguiz of U.N.A.M. and Logan Higgins of Lewis & Clark College. We spent three weeks collecting root samples and also tried to collect as many mushrooms in the alder forests as possible, including the Gyrodon species shown in Figure 2. Figure 1. My colleagues in the Mexican alder ectomycorrhizal community study. Dr. Roberto Garibay-Orijel (right) and Rodolfo Angeles-Arguiz (left) from the National Autonomous University (U.N.A.M.) in Mexico City, Mexico. Logan Higgins (not pictured) from Lewis & Clark College also participated in the project. Figure 2. The pore surface of a Gyrodon species collected from an Alnus acuminata forest in Veracruz, Mexico. We found a number of interesting patterns in the Mexican alder ectomycorrhizal communities (Kennedy et al. 2011). Like their counterparts in the Pacific Northwest, they also had very low species richness (only 21 species total). The dominant overall species in Mexico was member of the genus Clavulina, an ectomycorrhizal lineage never before reported with alders. Despite this novel association, many of the fungi present in the Mexican forests were strikingly similar to those present in alder forests in other parts of the world. For example, in the genus Tomentella, the top five most abundant species in Mexico had sequences that matched much better to sequences of Tomentella species sampled in forests in the United States, Europe (Estonia), and Argentina than to other Tomentella species sampled in Mexico. The sequence matches were extremely high (>97%), suggesting that alder associates with many of the same fungal species all across the world. 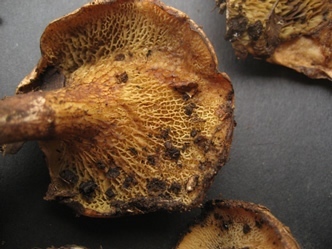 A similar global pattern was also evident in the genera Cortinarius, Lactarius, and Inocybe. Part of the similarity between the alder ectomycorrhizal communities in the Pacific Northwest and Mexico may reflect a common biogeographic history of their host species. A. jorullensis and A. acuminata are both descendants of the same alder lineage as A. rubra, and alders in western North America are known to all share a common ancestor that crossed the Bering land bridge from Asia (Chen and Li 2004). Members of this genus have gradually speciated and spread south over the last 20 million years. The current southern most range of A. acuminata is in the montane forests of northern Argentina, but it is widely distributed throughout the Andes and montane Central America (the distribution of A. jorullensis is more limited). Dr. Roy Halling and colleagues at the New York Botanical Garden have studied the ectomycorrhizal fungi associated with temperate and neotropical (i.e. new world) oaks and noted high similarities in those assemblages. They suggested that as oaks have also gradually moved south into neotropical regions, their ectomycorrhizal communities have co-migrated with them (Halling 2001). Our data from the alder forests in Mexico strongly supports that hypothesis and suggests that host-fungal co-migration may be a common phenomenon in the Americas. Given the high similarity among alder ectomycorrhizal communities in the western United States, Mexico, Argentina, and Europe, I am increasingly convinced that it is the co-symbiosis with nitrogen-fixing bacteria that makes alder ectomycorrhizal communities unique. With a post-doctoral research associate, a team of undergraduates, and researchers in France (to see if patterns hold at the global scale), we will be conducting a series of experiments that will hopefully provide a more definitive test of the role of nitrogen-fixing bacteria in alder ectomycorrhizal communities. Other researchers are currently investigating the composition of the ectomycorrhizal communities associated with alder in eastern North America, which will provide an important independent test of the co-migration hypothesis since the alder species there are descendants of ancestors that came from Europe over a North Atlantic land bridge. Since those host species do not share a common biogeographic history with those in western America, the alder-associated ectomycorrhizal communities in eastern North America may have some important differences from their western North American counterparts. We will also be exploring whether more closely related host genera (e.g. Betula) harbor a similar ectomycorrhizal community as found on alder. I look forward to keeping the readers of McIlvainea posted on these results. Chen, Z., Li, J. (2004). Phylogenetics and biogeography of Alnus (Betulaceae) inferred from sequences of nuclear ribosomal DNA ITS region. International Journal of Plant Sciences, 165: 325-335. Cox, F., Barsoum, N., Lilleskov, E.A., Bidartondo, M. (2010). Nitrogen availability is a primary determinant of conifer mycorrhizas across complex environmental gradients. Ecology Letters, 13: 1103-1113. Halling, R.E. (2001). Ectomycorrhizae: co-evolution, significance, and biogeography. Annals of Missouri Botanical Garden, 88: 5-13. Kennedy, P.G., and Hill, L.T. (2010). A molecular and phylogenetic analysis of the structure and specificity of Alnus rubra ectomycorrhizal assemblages. Fungal Ecology, 3:195-204. Lilleskov, E.A., Fahey, T.J., Horton, T.R., Lovett, G.M. (2002). Belowground ectomycorrhizal fungal community change over a nitrogen deposition gradient in Alaska. Ecology, 83: 104-115. Miller, S., Koo, C., Molina, R. (1992). Early colonization of red alder and Douglas fir by ectomycorrhizal fungi and Frankia in soils from the Oregon coast range. Mycorrhiza, 2: 53-61. Molina, R. (1979). Pure culture synthesis and host specificity of red alder mycorrhizae. Canadian Journal of Botany. 57: 1223-1228. Molina, R. (1981). Ectomycorrhizal specificity in the genus Alnus. Canadian Journal of Botany, 59: 325-334. Tedersoo, L., Nara, K. 2010. General latitudinal gradient of biodiversity is reversed ectomycorrhizal fungi. New Phytologist,182: 351-354. Townsend, C., Begon, M., Harper, J. (2008). Essentials of Ecology. Malden, MA: Wiley-Blackwell Publishers. Trappe, J. (1977). Ecosystemic functions of mycorrhizae. Colorado State University Range Science Department Science Series 26: 205-214.